Wydarzenia muzyczne w 1882 roku. ↑ a b c d e f g h i j k l m n o p q r s t u v w x y z aa ab ac ad ae af ag ah ai aj ak al am Paul Scharfenberger: 1882 (ang.). musicandhistory.com, 2015-10-14. [dostęp 2015-11-27]. [zarchiwizowane z tego adresu (2015-11-27)]. ↑ a b c d e f g h i j k l m n o p q r s t u v w x y z aa ab ac ad ae af ag ah ai aj ak al am Paul Scharfenberger: January 1, 1882 – December 31, 1882 (ang.). musicandhistory.com. [dostęp 2017-02-05]. ↑ The Snow Maiden (opera) (Rimsky-Korsakov, Nikolay) (ang.). imslp.org. [dostęp 2015-11-27]. ↑ 5 Duets, Op.66 (Brahms, Johannes) (ang.). imslp.org. [dostęp 2015-11-27]. ↑ The Smugglers (Sousa, John Philip) (ang.). imslp.org. [dostęp 2015-11-27]. ↑ Françoise de Rimini (Thomas, Ambroise) (ang.). imslp.org. [dostęp 2015-11-27]. ↑ All-Night Vigil, Op.52 (Tchaikovsky, Pyotr) (ang.). imslp.org. [dostęp 2015-11-27]. 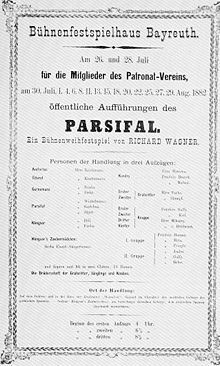 ↑ Parsifal, WWV 111 (Wagner, Richard) (ang.). imslp.org. [dostęp 2015-11-27]. ↑ 1812 Overture, Op.49 (Tchaikovsky, Pyotr) (ang.). imslp.org. [dostęp 2015-11-27]. ↑ Dimitrij, Op.64 (Dvořák, Antonín) (ang.). imslp.org. [dostęp 2015-11-27]. ↑ The Devil's Wall, JB 1:122 (Smetana, Bedřich) (ang.). imslp.org. [dostęp 2015-11-27]. ↑ Piano Trio, Op.50 (Tchaikovsky, Pyotr) (ang.). imslp.org. [dostęp 2015-11-27]. ↑ String Quartet No.11, Op.61 (Dvořák, Antonín) (ang.). imslp.org. [dostęp 2015-11-27]. ↑ Iolanthe (Sullivan, Arthur) (ang.). imslp.org. [dostęp 2015-11-27]. ↑ Chorale Prelude and Fugue on 'O Traurigkeit, o Herzeleid', WoO 7 (Brahms, Johannes) (ang.). imslp.org. [dostęp 2015-11-27]. ↑ Gesang der Parzen, Op.89 (Brahms, Johannes) (ang.). imslp.org. [dostęp 2015-11-27]. ↑ 7 Mélodies, Op.2 (Chausson, Ernest) (ang.). imslp.org. [dostęp 2015-11-27]. ↑ Piano Trio No.2, Op.87 (Brahms, Johannes) (ang.). imslp.org. [dostęp 2015-11-27]. ↑ String Quintet No.1, Op.88 (Brahms, Johannes) (ang.). imslp.org. [dostęp 2015-11-27]. Tę stronę ostatnio edytowano 1 paź 2018, 23:15.